It’s one of those lovely traditional gospel songs. ‘Old-Time Religion’ dates from 1873 when it found its way into a list of Jubilee songs. You can find it in various American hymnals, but in this country save perhaps Redemption Songs, it seems just a popular song in folk clubs as is also the much recorded gospel song ‘Will The Circle Be Unbroken’. 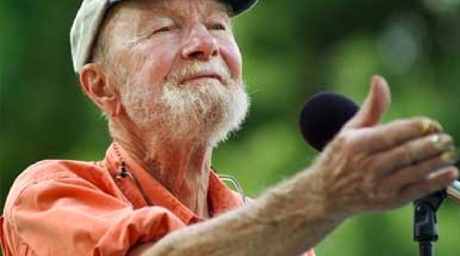 Pete Seeger, who died recently at the at the age of 94, sang it frequently, and it can be found on his album Pete Seeger: Singalong: Live at Sanders Theatre, Cambridge, Massachusetts, 1980, featuring Old Time Religion Lyrics’ and available online from the US company CD Universe. Seeger solo, and Seeger with The Weavers sang for the forgotten people, took controversial positions on major issues . He was there on the civil rights march from Selma to Montgomery, down in Mississippi for the freedom Riders, and courted anger by saying during the Vietnam War that US troops should come home . He knew something of Stenibeck’s lines in his famous novel “Grapes of Wrath’, namely “A fellow ain’t got a soul of his own, just a little piece of a big soul, the one big soul that belongs to everybody.” Seeger spoke on behalf of the souls of tens of thousands, and not just those in America. He said little per se about religion, but spoke in his songs many of the truths that come from Gospel readings. While general rock and pop wreaks of ‘protest’ songs, Jesus Music is horribly devoid of this genre, although in early times Graham Kendrick had anger and that had him very much then a folk singer who had a faith. Adrian Snell exhibited much compassion and indignation on some of his albums, and lyricists and poets such as Steve Turner and particularly Stewart Henderson on disc and text have stirred and questioned. One artist though has been around on the JM scene for an unbelievable forty years and has issued over 40 albums – Garth Hewitt. Hewitt’s latest is something special. 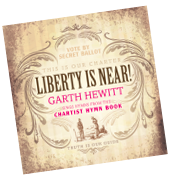 Liberty Is Near (KM Records) that has a sub-title that tells the basis of this recording : Garth Hewitt sing Hymns from the Chartist Hymn Book’. This takes us back to the 19th century to a Movement when hymns were political rallying cries written by workers,. Chartism was a national movement for political reform which began in the late 1830s and had a considerable base in some areas of Christian expression . In terms of hymn singing it was very much a time for dissenting groups, such as Methodists and Baptists, whereas the Anglican Church regarded hymn-singing as expressing, among other things, a very questionable nature of unbridled and controlled emotion. One of its supporters, the local preacher Abram Hanson desired preachers who preach Christ and a “full belly, Christ and a well-clothed back. Christ and a good house to live n. Christ and universal suffrage” Chartists were known to assemble in numbers at a parish church and having sent in advance the sermon the rector should preach! This is a beautifully arranged recording, tracks flow seamlessly and intelligently with Hewitt’s fighting vocals often adorned by femme back-ups. There are some great folk style moments of singing, as on ‘Hark, I Hear.’ – lusty in output, clear in words. The first few bars of ‘How Long’ seem those that introduce a long time back, ‘Eve of Destruction’ from Barry McGuire .Musically there is a jaunty air to proceedings, as especially on the track ‘Men of England.. a track that is followed initially by a gospel-ish intro to ‘Lo, In Thy Name’ that is beautiful. Hewitt has not sourced, and perhaps there is no tune book for the actual 19th century lyrics, for the tunes that might have been sung. Instead this talented singer-songwriter-musician, sets his own tunes or makes use of existing ones, whether folk or gospel or hymn.. Unlike most contemporary Christian albums this is not a set praising Jesus for whatever, it is firmly rooted in the kind of society those of religious belief should espouse. It is striking how many themes on this album remain today.. Of course the Chartist movement failed in many respects, although eventually some of its aspirations were realised. However, for starters, it might be asked why Christian based singers today do not have more than a passing interest n general inequality, or seeming rewarding in tax terms the rich, in food and health issues that in part come from cheap and quick profiteering, let areas of ecology, the staggering demise of plant, bird and animal due to farming and environmental practices. At least Mr Hewitt battles away. Other than his concert performances he is the Guild Vicar of all Hallows on the Wall in the city of London – a centre for organizations involved in issues of justice and art. Liberty s Near! provides an excellent discussion starter and is in itself an excellent release. Meantime for something unexpected – it’s in YouTube territory – and this is Sheldon Mangera - Nachoonga. Flick to http://www.youtube.com/watch?v=GbdUBrCC-14.